Picture it: Spending your holiday in a city where storefronts and restaurants come alive with festive lights and jolly displays, and the unpolluted night sky is aglow with stars. Most people don’t think of the Arizona high desert as a place to be during the holidays, but Sedona is considered one of the top destinations in the Southwest to get into the festive spirit. Thanks to its endless holiday events, fabulous dining with seasonal menus and access to the splendid nature within steps of the city, Sedona is garnering attention from visitors to spend their holidays in this magical place while taking advantage of the low seasonal hotel rates. Sedona is in the middle of incredible nature full of red spires, making it ideal for you to explore the area on a tour with your family. Consider an off-road adventure tour on an ATV, where you’ll venture through the hilly terrain of the land. While out on the open road, look for a family of javelina scampering away in the distance. Want something more laid back? Go on a relaxing train ride through the stunning Verde Canyon. During the holidays, the train turns into a winter wonderland where you can bring along your kids to take a magical journey to the North Pole. Watch your kids’ faces light up with excitement as you arrive to your destination—a Christmas village with toddler-sized houses. During the train ride, children will get to meet a bald eagle, acrobatic elves and a Christmas princess before finally meeting the real stars of the show, Santa Claus and his wife, Mrs. Claus. You can also hop aboard the train at Sedona Railroaders Annual Christmas Model Train Show on Dec. 14 at the Sedona Vista Village. The village will have a miniature model of trains in a replica of Sedona to admire. Hit the trail on a horseback ride where you can get up close and personal with the land on the backs of these majestic animals. And if you want to experience a white Christmas, get your flurry fix at Arizona Snowbowl in Flagstaff that’s approximately 45 minutes away by car. The area is known for its ski activities and is covered by machine groomed natural and man-made snow, making it easy for you to get a taste of both the desert and winter wonderland lifestyle in one day. Go skiing, snowboarding or take in the snowy scenery to get into the holiday mood. Watch a larger-than-life holiday show projected on Camelhead Rock, where reindeer, elves and Santa Claus dance above you at the Sedona Northern Lights show from Dec.13- 16. It doesn’t get more dramatic than watching the spectacular show in the middle of the red rocks with the sparkling night sky above you—the largest light show on a natural canvas. Be sure to check out several viewing areas and accompanying festivities. If you know a thing or two about Sedona, you’ll know it’s a spiritual place where visitors go for healing, meditation and connecting with Earth. Whether you’re practicing Buddhism or Christianity, get in touch with your spirituality at The Perfect Tree on Dec. 14 or take a series of yoga classes out in nature. To inquire about more ethereal events, reach out to the Sedona Metaphysical Spiritual Association to learn of workshops, readings, tours, retreats and private healing sessions. If you ask a local where to go to get a dose of arts and culture, they’ll point you in the direction of Tlaquepaque Arts & Crafts Village, which dazzles with festive lights and roaming carolers in the winter. Starting immediately after Thanksgiving, the village displays thousands of lights and kicks off the season with a Tree Lighting on Dec. 7. Once the tree lights up, the festivities will begin with a visit from Santa, live music and other holiday entertainment. The following day, on Dec. 8, is the Festival of Lights, where 6,000 luminarias (candles in bags) are laid out to honor cancer survivors. The River of Life Tabernacle Choir will perform as families meet Santa Claus and drink hot cider. It’s impossible to get into the holiday spirit without festive music. That’s where the Holiday Sweet Stroll comes in. If you prefer a visual performance with your music, you’ll love “The Phoenix Ballet’s The Nutcracker” presented by the Sedona Chamber Ballet, Dec. 1-2, at the Sedona Performing Arts Center where prodigious director Slawomir Wozniak dazzles the audience with his dancers. For a more exotic Christmas celebration, consider getting a ticket to see Esteban & Teresa Joy Acoustic Holiday Concert, Dec. 22 at Sound Bites Grill, where Flamenco meets holiday music. 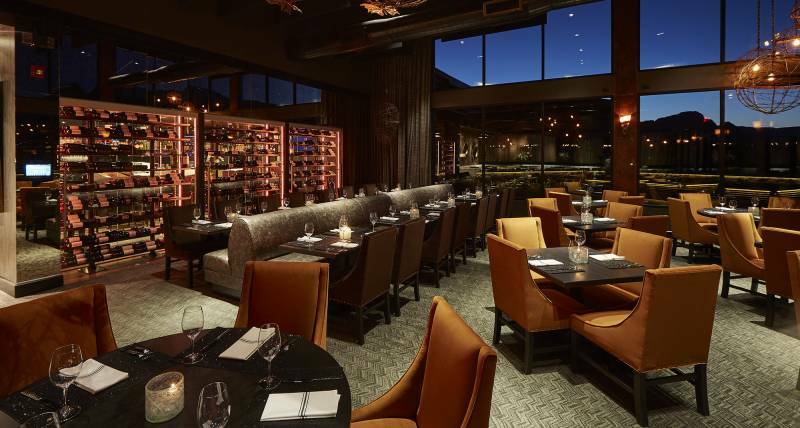 Whether you’re traveling with the kids or going away for a romantic holiday weekend, Sedona has plenty of restaurants serving everything from traditional Mexican or latin-inspired menus to locally sourced cuisine. Keep in mind, Sedona is quite festive so many of the restaurants will go all out with holiday decorating. Chances are, you’ll enjoy delicious steaks under gorgeous patio lights with a flickering Christmas tree and a roaring fireplace next to you. Most of the luxe restaurants give you a front-row seat to the red rocks, which turns into a jaw-dropping view during sunset hours when the sun kisses the peaks goodnight. 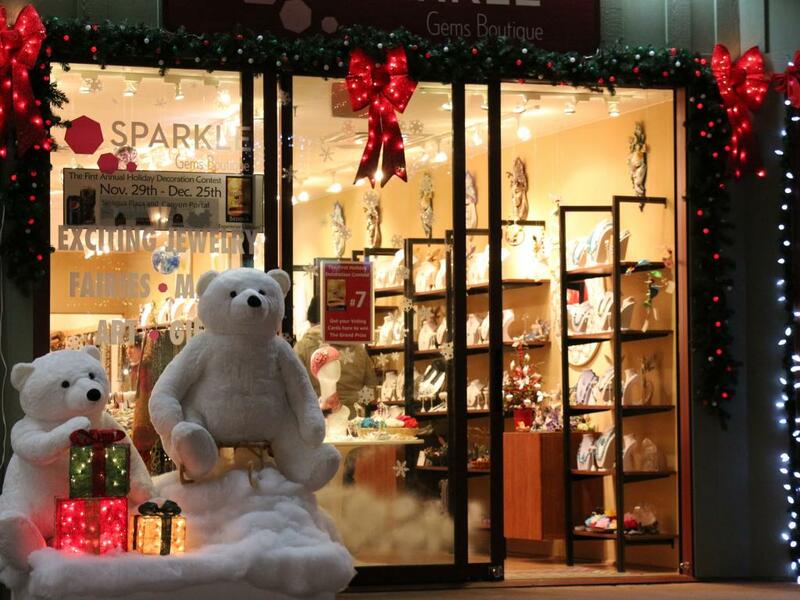 Afterward, grab a hot cup of cider or coffee from a nearby café and go for a walk through Uptown to admire the beauty that is Sedona and the dazzling holiday lights. Some people are last-minute holiday shoppers, but that’s okay because Sedona has your back with plenty of one-of-a-kind boutique shops and art galleries with original items available for purchase. You can buy anything from a Southwestern-style turquoise bracelet and hand-painted potteries to traditional and contemporary fine art. Or add a personal touch to your gift by making it yourself at Sedona Arts Center, where art classes are offered for visitors to learn the art of pottery making, painting, jewelry making and more. If you’re familiar with the world-famous glass sculptor artist Dale Chihuly you’re in luck. You can learn to imitate his glassblowing art at The Melting Point, where you can create gorgeous pieces of glass art. It’s advised to register for a class as early as possible during the holidays. And not to mention, it can’t hurt to take home a piece of art for yourself as a personal souvenir of your holidays in beautiful Sedona. 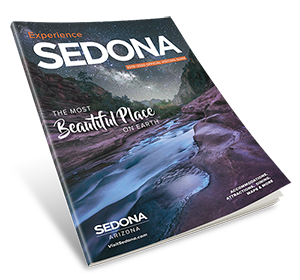 For further inspiration, browse VisitSedona.com and explore Sedona’s Secret 7 that reveals the best sites for hiking, biking, stargazing and more. And remember, sometimes the experience is the gift.